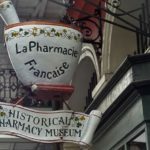 The New Orleans Pharmacy Museum is the perfect prescription for your reception, meeting or corporate party. Located in the heart of the French Quarter, the Museum’s 19th Century courtyard is the ideal setting for your special event. The tropical courtyard provides an opulent “New Orleans” party ambiance. Share an unforgettable celebration with your guests, surrounded by the decadence and romance of New Orleans past. To further interest in the history of pharmacology and promote its further development for the benefit of the general public. The museum is housed in the site of the apothecary of America’s first licensed pharmacist.